West Orange, NJ – August 5, 2016. 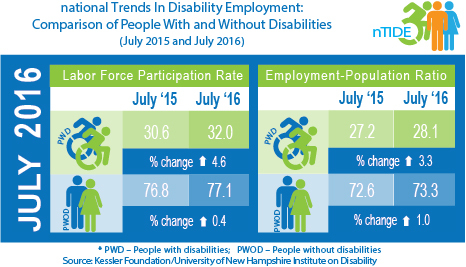 For the fourth straight month, major economic indicators increased for people with disabilities, according to today's National Trends in Disability Employment – Monthly Update (nTIDE), issued by Kessler Foundation and University of New Hampshire’s Institute on Disability (UNH-IOD). The Workforce Innovation & Opportunity Act of 2014 (WIOA) focuses on strategies that facilitate the transition of jobseekers with disabilities to the workplace. To improve available services and facilitate the process of transition, WIOA promotes the coordination of state vocational rehabilitation programs with employment and training services. By aligning workforce development programs with employers’ needs, jobseekers will be better equipped to move into available positions. In the Bureau of Labor Statistics’ Jobs Report released Friday, August 5, the employment-to-population ratio for working-age people with disabilities increased from 27.2 percent in July 2015 to 28.1 percent in July 2016 (up 3.3 percent; 0.9 percentage points). For working-age people without disabilities, the employment-to-population ratio also increased from 72.6 percent in July 2015 to 73.3 percent in July 2016 (up 1.0 percent; 0.7 percentage points). The employment-to-population ratio, a key indicator, reflects the percentage of people who are working relative to the total population (the number of people working divided by the number of people in the total population multiplied by 100). The labor force participation rate for working-age people with disabilities increased from 30.6 percent in July 2015 to 32 percent in July 2016 (up 4.6 percent; 1.4 percentage points). For working-age people without disabilities, the labor force participation rate also increased from 76.8 percent in July 2015 to 77.1 percent in July 2016 (up 0.4 percent; 0.3 percentage points). The labor force participation rate is the percentage of the population that is working or actively looking for work. Coordination of services is a useful approach on the local, as well as the state and national levels. While job training and employment organizations are available to help people with disabilities enter the workforce, lack of coordination often results in gaps in service. A new transition program being implemented by Access Living in Metropolitan Chicago provides comprehensive services for high school students with disabilities. Students in the Realizing Education and Advancement for Disabled Youth (READY) Program can choose from two focus areas – college access or employment. Students focusing on college access work one-on-one with an education specialist to select and apply to colleges, explore support services, and secure financial aid. In the employment focus, students receive one-on-one assistance with skill development, resume writing, interview techniques, and job hunting. The READY program coordinates with employment readiness organizations and area colleges to provide a continuum of services, including ongoing support to ensure success for participants in college or in the workplace. The goal is to close the employment gap for students transitioning from Chicago Public Schools – only 36 percent of Illinoisans with disabilities achieve employment compared with 74 percent of those without disabilities. The READY program is funded by a large, two-year grant from Kessler Foundation. In July 2016, among workers ages 16-64, the 4,444,000 workers with disabilities represented 3.1 percent of the total 143,497,000 workers in the U.S. The next nTIDE will be issued on Friday, September 2, 2016.
the Department of Labor, joins Drs. Houtenville, O’Neill and Dr. Michael Gamel-McCormick to discuss today’s findings. You can join live, or watch the recordings at www.ResearchonDisability.org/nTIDE.